Royal Albert Fine Bone China Tea Set - Charmaine Rose Pattern - Made in England from 1945 through 1950's Only - Total of (16) Pieces. "Charmaine" by Royal Albert Fine Bone China is a beautiful Red Rose on a White Background, with Gray Leaves, and having 22kt Gold Trim. 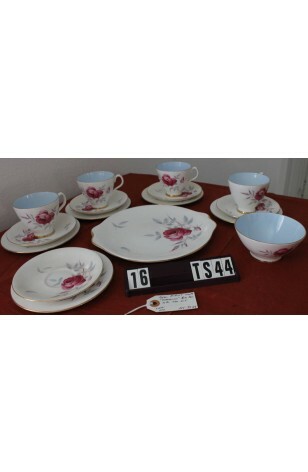 The Insides of the Cups and Sugar Bowl are a Robin's Egg Blue, making this Tea Set a Stand-out. All Pieces are Rimmed in 22kt Gold, as well as 22kt Gold on the Footed Items and the Cup Handles. 5 - Saucers - 5 1/2"
5 - Bread/Dessert/Tea Plates - 6 3/8"